Learning another language is useful, yet most adults find it very difficult to do so successfully. It is a complex skill that draws upon already established knowledge (the native language or known languages), the brain's processing power (e.g., working memory, executive function), motor coordination for speech production, etc. My research asks questions related to what makes learning a new language difficult, who is particularly good at learning new languages and why, how language learning and bilingual language use change the brain, and individual differences in learning and strategies. Ultimately, I hope to contribute to the question of how we can optimize language learning for anybody who wants to try. I use both behavioral and neuroscience methods to investigate questions of the adult language learner. 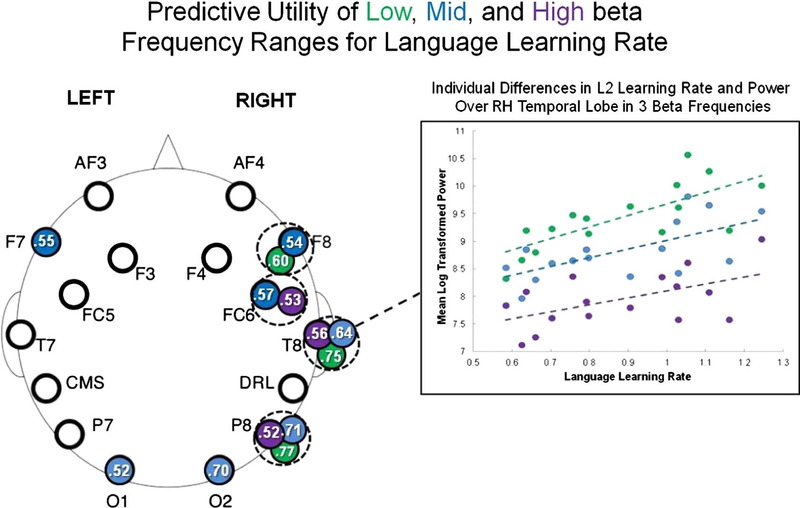 The temporal sensitivity of EEGs allow us to examine language processing and learning at the millisecond timescale. EEGs also are sensitive to learning before overt behavioral measures. Methods like event-related potentials (ERPs) allow us to probe the brain's processing of specific stimuli, whereas oscillatory analyses help unravel neural synchrony that underlies the brain's connectivity and communication. For adults especially, the native language plays important support roles during the acquisition of another language, informing learners about how to allocate attention, the different functions that words and word endings can mean, etc. However, research on proficient bilinguals shows that learning and using two languages in turn changes how bilinguals use their native language, making it more similar to their other language where they overlap, and making it slower or more difficult to access where they don't. ​Given how entrenched and automatic the native language is in adult monolinguals who begin learning a new language, the propensity of the native language to change in these ways to accommodate learning a new language may predict learning success. We tested the hypothesis that these changes can be detected in early stages of language learning, and that some learners are more accommodating than others. You can't turn off hearing. You always hear what is going on around you, whether it is in a language you understand or not. And in fact, ambient exposure to unknown languages​ actually produces low levels of learning, such as being able to detect word boundaries or simple vocabulary. Language diversity can be very low or very high in different areas of the world. In most of the US and UK, it is common to hear only English on a regular day. In other places, like Hong Kong or southern California, every day is filled with more than one language. We found that English monolinguals who have been living in a diverse environment, like southern California, are sensitive to subtle, unfamiliar distinctions in the sounds of a foreign language whereas monolinguals in a homogeneously English environment are not. Exposure to ambient linguistic diversity actually promotes a person's ability to learn a new language, regardless of whether they speak the languages in the environment or not. Some people seem to learn new languages easily, while most of us struggle. One thing that makes learning easier is already knowing more than one language (i.e., bilinguals). But not all bilingual experiences are alike-learning a second language from birth or a young age often relies on more implicit learning, whereas learning later in a classroom typically relies on more explicit learning. How do different bilingual experiences and different learning strategies contribute to a person's language learning trajectory and success? Are these individual differences also reflected in how they process their known language(s)? For five minutes, close your eyes and clear your mind. That's all we ask people to do while we measure their brain activity with EEGs. Resting state EEGs capture the baseline state of the brain, unperturbed by the outside world (well, mostly). And in fact, the activity of the brain at rest can predict 60% or more of the individual differences in the rate and outcome of learning a new language (Prat, Yamasaki, Kluender, & Stocco, 2016). Computing advances have made it possible for scientists to analyze incredibly complex datasets to determine underlying structures and what variables are important. 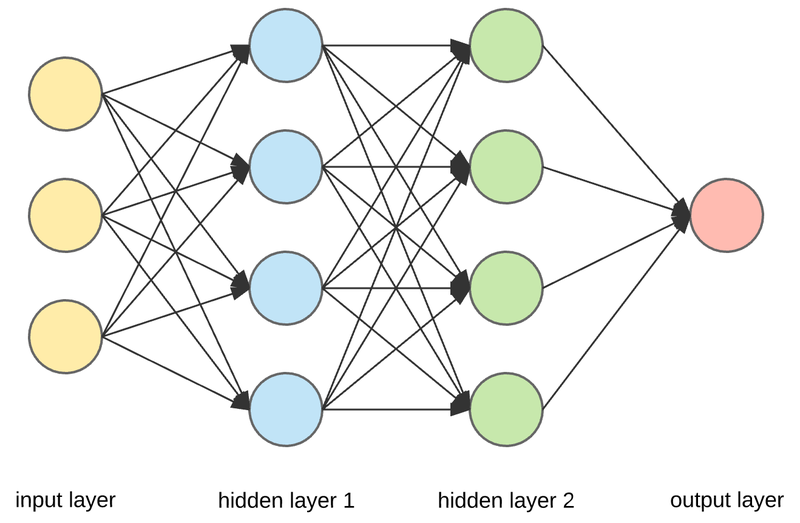 We feed machine learning algorithms the multidimensional, highly interconnected resting state EEG data and it helps us discern what aspects of the brain activity are most relevant for predicting language learning success. Using what we know about what areas of the brain are important for language learning, and what machine learning tells us is important about the brain's resting state activity, we can use neurotechnologies like transcranial direct current stimulation (tDCS) or neurofeedback training (NFT) to try to improve language learning in adults. Stimulating the brain's cortex with low levels of direct current can induce plasticity and facilitate learning. tDCS holds promise as an available technology to facilitate language learning. Neurofeedback training is a way of implicitly training the brain to re-engage the brain states that we pre-identified as being optimal for language learning. Using a brain-computer interface, people learn to "fly" a helicopter on the screen, making it go higher and earning points when their brain activity more closely approximates the ideal brain state.